It's that time of year again. If you're reading this article, then you likely have a poker player on your list that you need to shop for this holiday season. Well, you've come to the right spot because the PokerNews Gift Guide has 10 great gifts. Regular price $1,200, but receive 50% off if purchased by New Year's Day. Big Slick Poker Academy is a 4,000-square-foot brick-and-mortar live poker training facility just north of Dallas, Texas, and for the past two years, they have been steadily making their way onto the poker scene. With two full-time instructors and several guest pros, they've been offering classes and coaching to hundreds of poker enthusiasts since 2012. Their reviews on Google, Yelp, and Facebook all tell the tale — these guys know poker, and more importantly, they know how to teach it. Their ultimate course, and this year's PokerNews choice for the ultimate poker gift, is their two-day training camp dedicated to live tournament poker. "Championship Poker — Playing for the Win" is hosted by Team Big Slick captain and Triple Crown winner Gavin Griffin, and includes 16 hours of intense, modern live poker training curriculum designed to help you start binking more tourneys. The course will be hosted multiple times in 2015 out of their Dallas facility, and several stops nationwide are planned as well, including Florida, California, and Las Vegas. The regular price for the course is a chunky $1,200, but they're offering any advance purchase for 2015 for half off, if purchased by New Year's Day. This is an absolute steal in our opinion and a must for any poker player serious about taking their tournament game into beast mode. Check them out at www.BigSlickPokerAcademy.com and www.TeamBigSlick.us. Melin Brand is a luxury hat company that takes headwear to the next level. Everyone knows that poker players love style, especially when they are so many people around constantly eyeing them. It's important to play your best on the felt, but it's also important to look your best while seated at the table, and that's where Melin Brand hats come into play. According to the company's website, they "source the best materials from around the globe" and also "aim to change the history of fashion forever." With celebrities and athletes such as Dwayne Wade, Derrick Rose, Reggie Bush, and many others sporting the goods, this is definitely a product any poker player will enjoy. Hats start at $150 and go all the way up to $1,200, and you can start shopping by clicking here. Give the gift of winning poker — to your loved ones or to yourself! AdvancedPokerTraining.com is the #1 poker training site, the only site with scientifically proven teaching methods. Train for full-ring, six-max, sit-n-go, or multi-table tournaments, learning while you play up to 500 hands an hour. Get real-time advice, take the unique “Beat the Pro” challenges, or study your training plan and reporting tools. But don’t just take our word for it. According to AdvancedPokerTraining.com member Chris McCarthy, "I just wanted to say that the MTT trainer was a great help in cashing at the World Series of Poker Circuit events this past weekend. Made back-to-back final tables. The goal is to win a WSOP bracelet or WSOP Circuit gold ring in 2015. I think I'll do it with training on APT. Being able to set the skills level of the players and parameters of the game is great." Founded during the 2012 World Series of Poker, RunGoodGear.com has become poker’s premier online apparel store. Find shirts, hats, hoodies, and more for on and off the poker felt wear. They specialize in comfort and style, making anything RunGood a great gift for any player. The company can be recently seen on ESPN during the 2014 WSOP Main Event final table via Jorryt Van Hoof, Dan Sindelar, and William Tonking’s fan rail RunGood designed shirts. If the poker player on your list has ever been to the WSOP, then he or she undoubtedly knows about All-American Dave and his meal service. Not only are these meals convenient and tasteful, but they're extremely healthy and geared towards keeping a poker player in peak condition for the long grind. Over on All-American Dave's website, there are a couple different meal plans available for purchase. These are great of the poker player you're buying for is based in Las Vegas, and especially good if you're able to give this as a gift to use at the 2015 WSOP. Not all poker players are live poker players. Many of them spend their hours grinding online behind a computer desk. When such long hours are being played, it's very important to have a good, quality chair that can go the distance with you. Our friends over at Laura Davidson Direct specialize in contemporary style office chairs that don't come with a massive price tag. According to the company's website, "Laura Davidson provides high-quality, stylish, and comfortable mid-century modern chairs for a fraction of prices found elsewhere. Our customers range from businesses looking to buy dozens of chairs for their company, to individual buyers looking to add a touch of style to their home or office. Every chair we sell comes standard with a one- or two-year warranty, and is BIFMA tested and certified. What is BIFMA you ask? The Business and Institutional Furniture Manufacturers Association develops and publishes standards for office furniture products so you know you're not buying something that's going to fall apart in a few months." You can shop right on the website, and office chairs range from $125 to $195. We recommend either the Soho design or the Futura design. For an additional $10 off any order of $100 or more, enter the discount code "POKERNEWS" when you make your purchase. Poker players love accessories, that's a fact. One of the best accessories a poker player can have is a quality watch, but not everyone wants to drop a large tournament buy-in or two on a timepiece. That's where Tsovet Watches comes in, offering quality watches that will no doubt make an impression, but without the need to drop thousands of dollars. There are several collections available of Tsovet Watches, but our favorite is the Field Collection. There are several different colors available, different faces, and varying bands, but each with a unique style that will look great on the worst of a poker player as he or she riffles through some chips at the table. Prices within this collection range from $175 to $450, but all collections are comparable in cost and very affordable. For more information, including an online shopping center, please click here. Tournament Poker Edge is the only poker training site that focuses exclusively on tournament poker. The site features over 1,000 training videos, as well as articles, free poker podcasts, blogs, and a strategy forum for members to discuss hands. Their instructors include Casey "bigdogpckt5s" Jarzabek, Andrew "foucault82" Brokos, Ben "KidCardiff6" Warrington, and others. For as little as $25 per month, members get full access to all of the content on the site, and their videos are DRM free and optimized for viewing on your iPad or other mobile device. Tournament Poker Edge is the perfect gift for any MTT player. 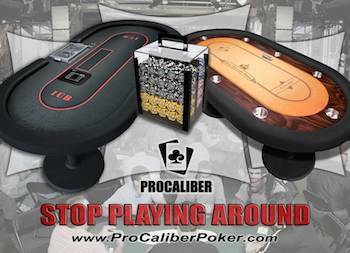 ProCaliber custom poker tables are designed specifically to fit your game, your style, and your life. You can customize your table with unique casino-style imprints and personal text can be added. ProCaliber poker tables are built to last, with only the best materials. Every option is available on our professional poker tables at ProCaliber. Use the custom table builder app, and with a few clicks, you can choose your cloth, wood color, and leather. Professional gaming suede is used for the look and feel of a casino poker table. ProCaliber's custom poker tables are made in the USA, using only the finest craftsmanship. With the surge in non-hold'em events (including the popular "dealer's choice") at this year's World Series of Poker, and the potential for further growth in 2015, it's no wonder so many hold'em players are adding "learn mixed games" to their list of New Year's resolutions. Thanks to the newly-released A Poker Player's Guide to Mixed Games, learning these games has never been easier. A comprehensive one-stop-shop introduction to the games of today's most popular mixes, this book covers key strategies for H.O.R.S.E., badugi, badeucy, triple draw, single draw, and others.